Storytimes with Moxie | entertaining storytimes with spirit! The last year has seen a great deal of change and transition in my life. Sadly, I abandoned this blog as I worked though those changes. 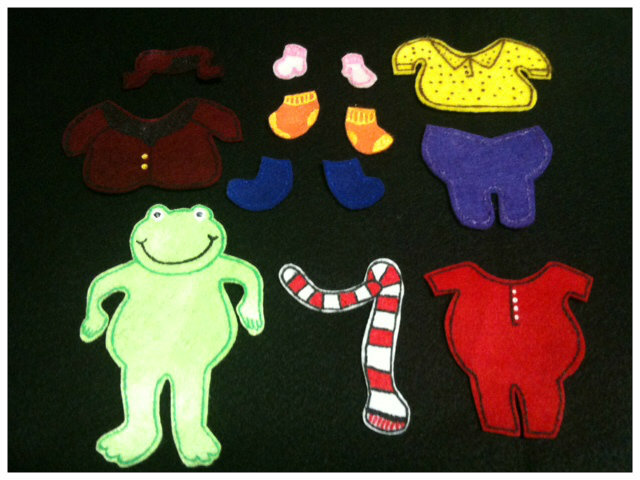 I hope to get back to creating with felt very soon which will me some fun changes here as well. Stay tuned! My post this week is a little bit different than usual. This creation isn’t based on a specific story and probably will never make it’s way to the library. 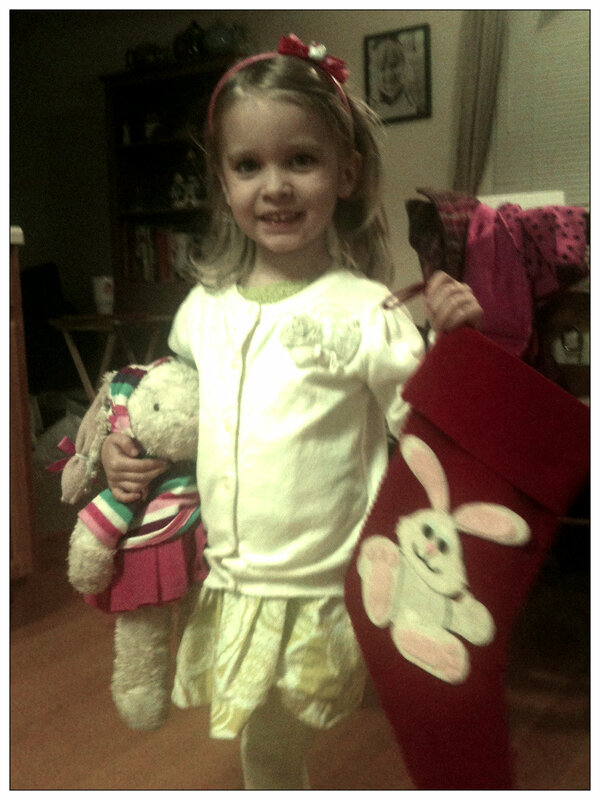 My 4 year old daughter, lil’ A, has a stuffed bunny that goes everywhere with her. When she draws a picture of her family there is Mommy, Daddy, A, and Hoppy. We hung the stockings and A asked if there was one for Hoppy too. Well, there is now! I purchased a plain red felt stocking at JoAnn’s for 60% (less than $2.50) and created a felt bunny as decoration and to show who the stocking belongs. Lil’ A and Hoppy were thrilled with the results. 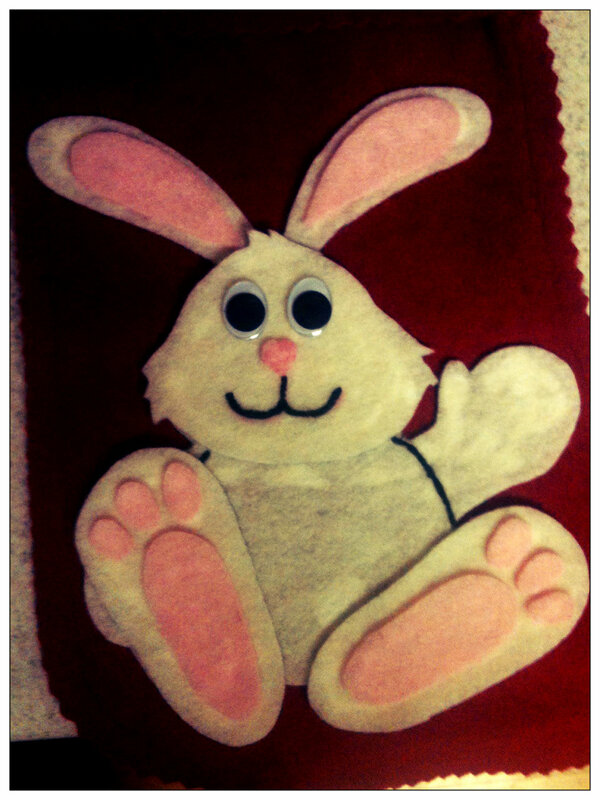 My closest girlfriend criticizes how I encourage her imaginative play with Hoppy. Hoppy sometimes eats dinner with us, holds hands between us, and is always included in play. I feel strongly that this level of creative play fosters the growth of her Narrative Skills, making her a stronger reader later on. A’s attachment is not unhealthy, she can step away from Hoppy without meltdown and there are limitations on where Hoppy is allowed to go (she stays in the backpack at school and in the car when at places A would not be able to carry her). She uses her stuffed friend as a way to enhance her experience. 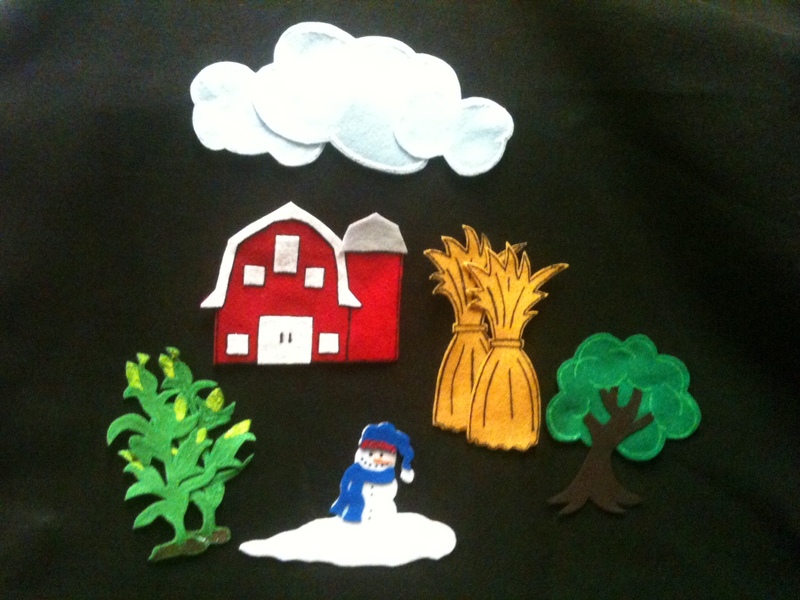 Visit Linda at Notes from the Story Room for the final Friday Flannel Round-up of 2011! 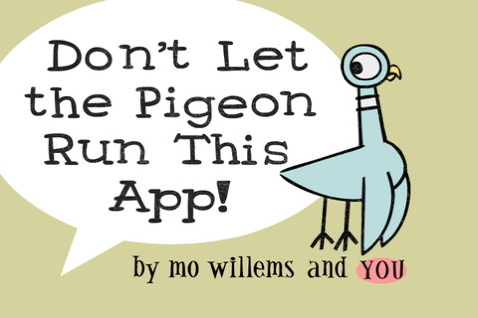 The app features a choose-your-own-adventure style of story creation and a draw the pigeon game. There are a ton of options in regards to creating stories, including the option for the child to record themselves answering questions about the stinkiest thing and a type of food. Always the child can record their name to be attached to the byline. The app allows for 6 stories to be saved to listen to later. 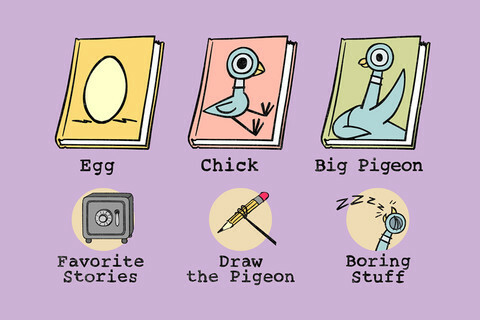 Drawing the pigeon has a tutorial by Mo and the option to free draw. 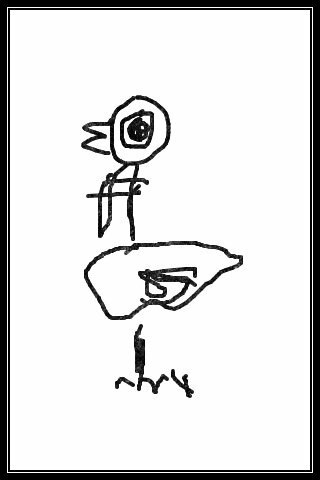 I now have various pigeonesque drawing in my photo album. It’s kinda hard to follow along with the tutorial on the small screen of an iPhone. It would be much more fun on an iPad but it hasn’t stopped lil’ A! Overall the app is great and definitely kid approved. My suggestion would be to wait until the price comes down. I had hoped there would be more games like on the PigeonPresents website especially considering the $6.99 price tag, which is the most I have ever spent on an app (even Elmo’s Monster Maker wasn’t that much!). Fingers crossed that future updates will bring more fun! 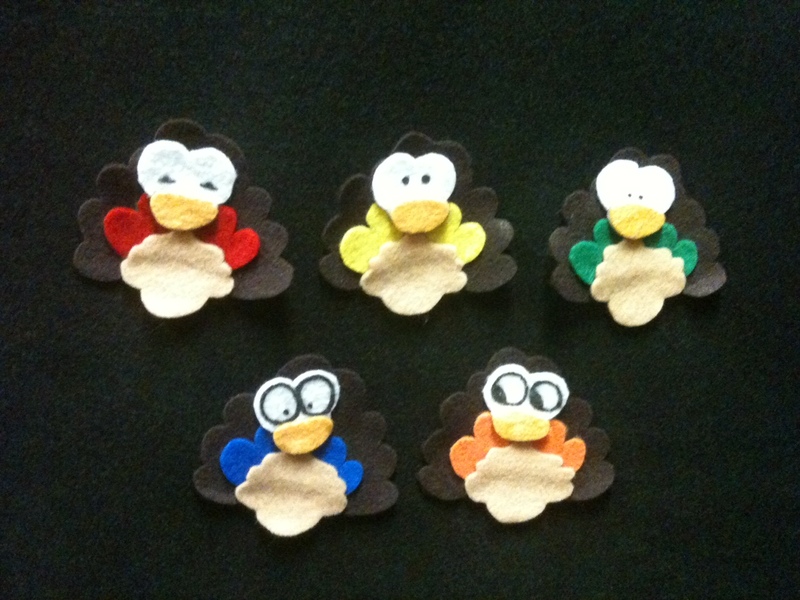 Gobble Gobble Gobble! This week’s Flannel Friday contribution is a Thanksgiving theme! One waddled off, and then there were two. One waddled off, and then there was one. Turkey in the straw, my darling. Turkey in the snow, my darling. Turkey in the sky, my darling. Turkey in the barn, my darling. Turkey in the corn, my darling. Turkey in the tree, my darling. For more Flannel Friday goodness, check out the round-up hosted by Katie at Story Time Secrets or the Flannel Friday Pinterest page. Happy Thanksgiving! I’m still in the middle of create a Turkey in the Straw flannel. Nothing brand new to share but here is one from a couple months ago that I created for a theme on Royalty. One of my favorite things about #FlannelFriday is the inspiration from all the immensely talented contributors. I have created several flannels based on their original ideas. 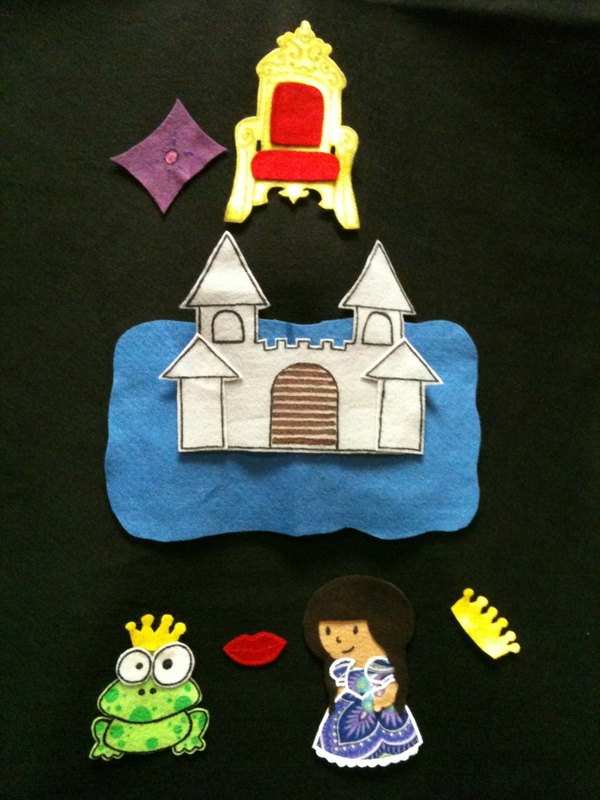 This week I present There’s a Castle in the Middle of the Moat inspired by Mel! There’s a castle in the middle of the moat. You can add as many verses as your creative brain can dream up! This was a fun twist and a nice departure from my habit of creating another 5 Little… flannel. Hopefully by next week I’ll have the Turkey in the Straw flannel complete. 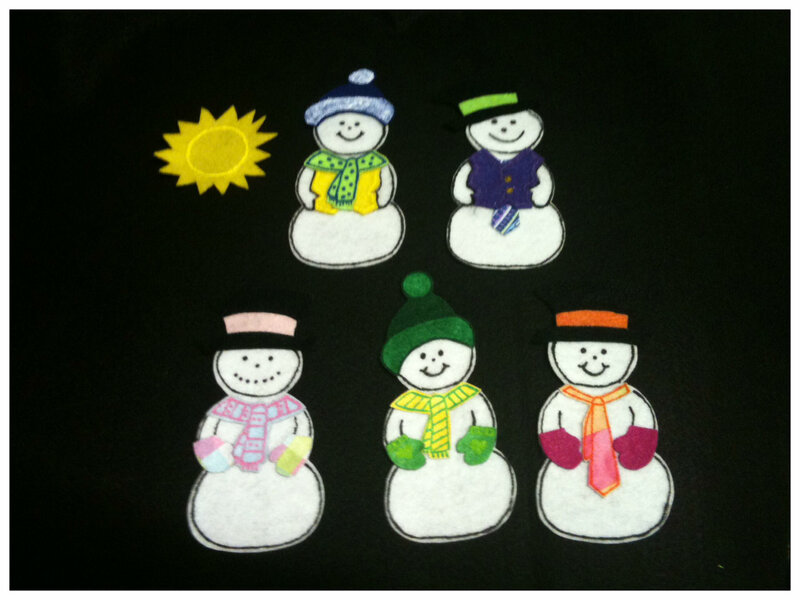 The Flannel Friday Round-up this week will be posted by Cate at Storytiming. For even more inspiration, check out the archive over at Anne’s blog So Tomorrow. 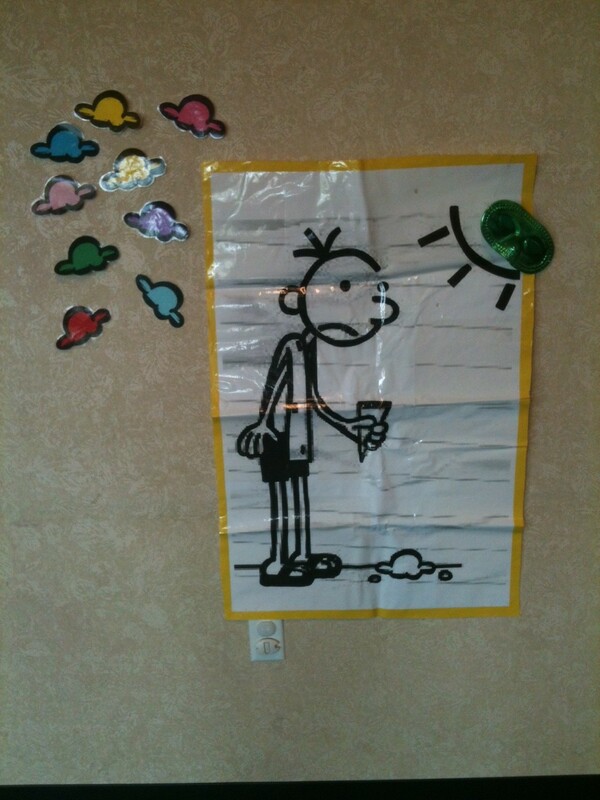 Diary of a Wimpy Kid Party! 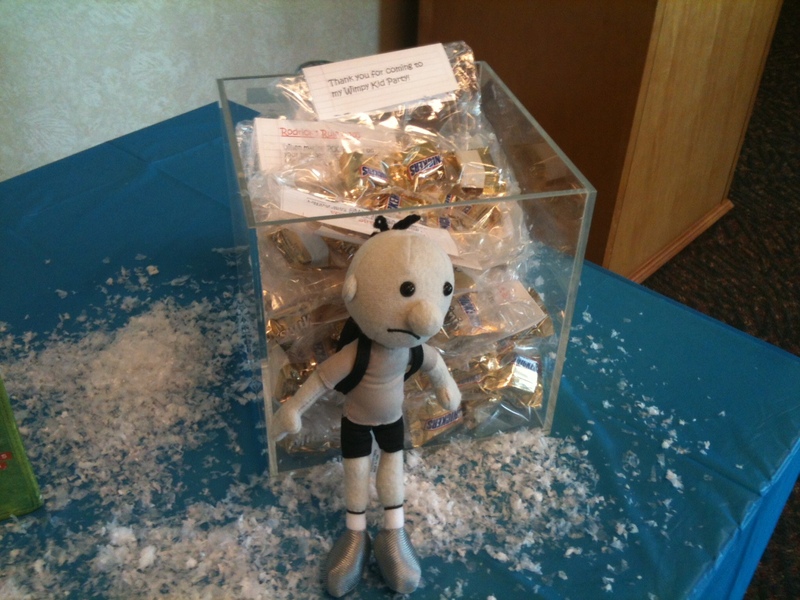 To celebrate the November 15th release of the 6th book in the Wimpy Kid series, Cabin Fever, I held a party to celebrate all things Wimpy kid! Whether is was the surprisingly good weather, college football Saturday, or laziness, this was my lowest attended Wimpy Kid program. Typically I have 30+ in attendance but the 5 who showed were so much fun. This smaller group caused me to alter my game but I think the program was all the richer for the change. We sat in a circle and shared talked about who had read which books and what were the favorites. 3 out of 5 had read all 5 books and were anxious for the newest. Then we dove into some trivia. The trivia was tough and it was so much fun being on the presenter side to see the light bulbs flash on when the answers reminded the kids of parts of the story long forgotten. After the trivia I split the kids into 2 groups – 3 versus 3 (I was thrilled I got to be a part of one of the groups). In the middle of the room I placed a large basket full of wadded up paper. We talked about the premise of Cabin Fever being that Greg is trapped in the house due to a snowstorm and that we were going to have our own snowball fight. 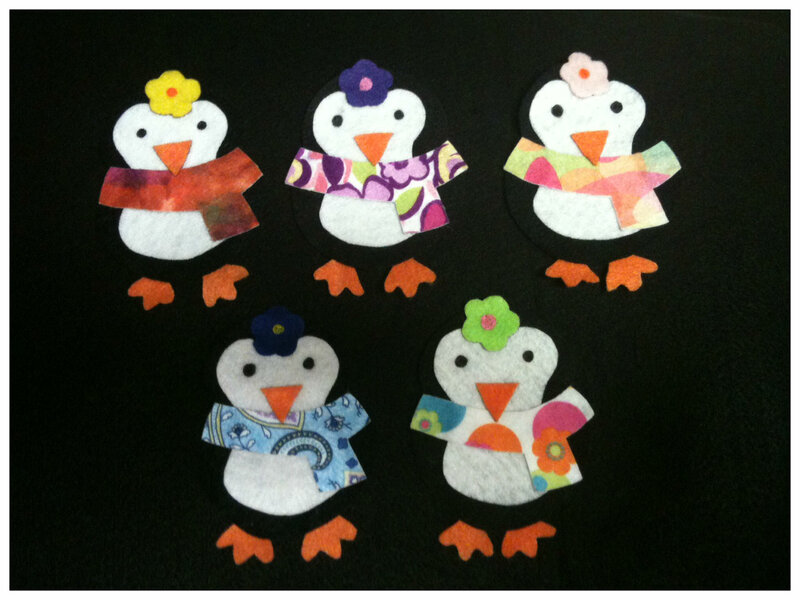 On the count of 3 we all rushed the basket and started winging paper snowballs at each other. *cue giggles* This went on for several minutes but could have lasted for 30! I called the group back but asked them to bring back 3 snowballs each to open. Inside were written writing prompts, a word or phrase describing a person, place, or action. We took turns reading them aloud and giggling at the silly combinations. Each kid left with either a button with Greg or the Loded Diper logo (I’m a huge fan of our branch button maker – GREAT investment), a Cabin Fever poster thanks to my friend in our Collection Development Department, and a treat bag with mini snickers bars with the bag topper printed from Cap Creations. 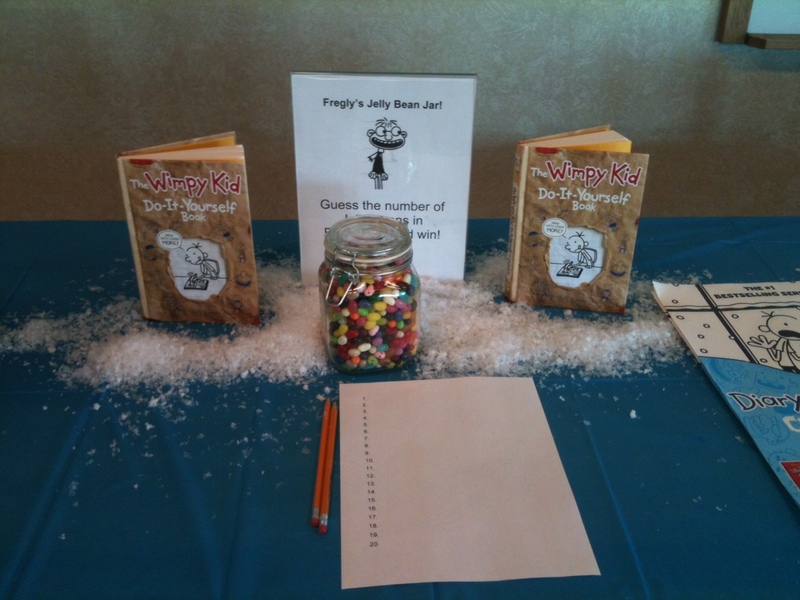 Activities or ideas I am saving for next time… Wimpy Kid Uno, Cheese Touch Game, cheese path to the meeting room, Talk Like Fregley game (which fun with a large group), and more! 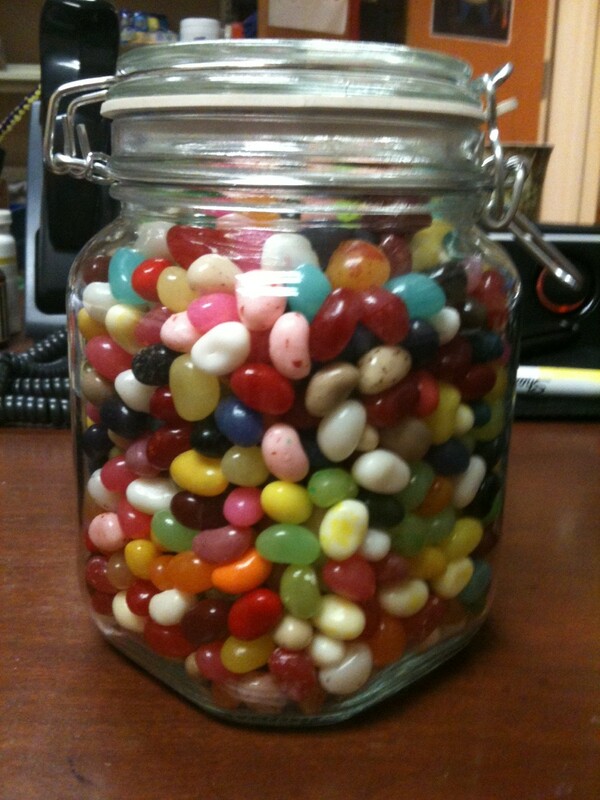 Leave your best jelly bean guess in the comments!